There is plenty to experience, watch, see and learn at this year’s SDG Global Festival of Action! Do an interactive tour of the SDG Action Zone in the Lobby and get inspired, mobilize and connect for the global SDG movement! Every ACTION, big and small, can have a transformative impact in making the Goals a reality! #IamSDG showcases the SDG butterfly effect to transform the world and show that we stand and fly behind the Goals! Augmented Reality and the digital flying wall brings brings illustrated art to life by turning each of the 17 SDGs into wings. Come and take a photo at the butterfly digital wall and show the world that you are the SDGs! The UN SDG Action Awards identifies and recognizes innovative and impactful SDG campaigners and mobilizers around the world! Explore the UN SDG Action Awards initiatives, vote for the People’s Choice Award, and share your favorite initiatives on social media! Draw and paint on our Festival SDG mural! We also invite you to record a selfie video in front of the mural and tell us about the world you want to see and what ACTION are you taking to make sure that happens! The Global Day to Act4SDGs is the primary mass mobilization activity of the UN SDG Action Campaign. It is a global yearly call to action to engage all stakeholders across the world to take action for the SDGs. Explore http://act4sdgs.org and see what happened in your communities, and sign up to take part in the next Global Day! MYWorld is a global citizen survey designed to empower people and ensure that everyone, even from the most marginalized communities, can share their perspectives on the Sustainable Development Goals. MYWorld is the largest global survey ever carried out by the United Nations. Take the MYWorld survey, explore results in your country, explore the scientific question library and take photos with the giant MY World letters! How is your country reporting on the SDGs? With the UNDP/UN DESA interactive data visualization platform for Voluntary National Reviews (VNRs), people can search in and across national reports, compare countries and regions and learn more about how the SDGs are interlinked! The visualization breaks down the Voluntary National Reviews and shows in an easily-digestible way how countries are reporting SDG progress, how SDGs are interlinked at the national level and how progress is reported over time. Users can also compare reports between countries, regions and Goals. Explore the visualizations and learn how citizens and organizations can contribute in the follow-up and review process of the 2030 Agenda! Innovations offer an interactive and immersive experience for Festival-goers. Learn more about the latest trends and pioneering approaches to SDG communications, visualizations and transformative technologies! Hogan Lovells and Barefoot College believe the illiterate of the 21st century are those who cannot unlearn and relearn – they believe in the adaptive intelligence of rural women to leverage technology for the future. Think you have what it takes? Join us to test your skills and see if you can unlearn, learn, and relearn like a solar mama. The Food Forever Experience is an international event series that gives a glimpse of the future of food. By working with innovative chefs to cook up delicious dishes using lesser known ingredients, we aim to “plant the seed” for a more diverse, nutritious and sustainable future. Come check out the exhibit in the lobby to learn more! And on Day 1 of the Festival, May 2nd, during the Networking Hour from 5 to 6pm, come join the Food Forever Experience and taste the future! Local, renowned chefs will be challenged to create delicious, diverse appetisers. The dishes will incorporate a range of ingredients currently on the margins of our food system and of local importance in the region such as wild cornel cherry, walnuts from the Rhine valley, wild peach, sweet clover and more. While the tasting is based in Bonn and features the talents of local chefs, the reach is global: We all eat three times a day. That’s three opportunities we have to decide which foods to consume, where to source them, and which establishments to support. Follow Food Forever. What is a border? Is it a physical barrier – such as a wall, border or fence – or is there something more fundamental that underlies the psychological concept of a border? When there are no longer any physical borders, do we perceive virtual ones? Do we cross them? In this virtual reality experience, physical, personal and social borders are questioned and re-located. MOSAIK is an interdisciplinary art collective combining scientific and artistic research principles founded by Ilja Mirsky and Vivienne Mayer. They create immersive VR experiences which aim on re-thinking what borders mean. MOSAIK uses an Oculus Rift and a Kinect sensor to bring people together in a virtual environment and our real space. While this happens, Festival-goers can watch what is happening on display screens in parallel to what is happening in the virtual environment, which gets us thinking about dissolving border concepts. Meeting places positioned throughout the venue for SDG stakeholders from across the globe to connect, network, share ideas, plans and build partnerships. These designated spaces provide participants with the opportunity to schedule meetings new and existing partners to connect and share ad hoc presentations. You can change the world through eating chocolate! How? In eating our change chocolate. We are Plant-for-the-Planet, a youth-led organization who among other things plants trees with help of the change chocolate. Thus we are fighting the climate crisis. Simultaneously it also contributes to achieve all other SDGs. Therefore we are introducing a special SDG chocolate this fall. The chocolate not only sounds good, it also tastes good. If you want to check it out for yourself, come and find us. We will be giving away chocolate samples while you can see where the trees from your bar are planted. Plant for the Planet international on Facebook, Instagram and Twitter / Die Gute Schokolade on Facebook, Instagram and Twitter. Action requires clarity. And clarity can be achieved through visualization! Unity Effect is creating an interactive and real-time visualisation of the SDG Global Festival of Action. You want to know who else is working towards implementing the same SDG? Or see with whom you are (already) connected? Then pass by our innovation booth and experience the power of connections and weaving networks! Learn more at www.unityeffect.net and see video from the last Festival. WFP: Disrupting Hunger? Yes We AR! Through real life stories in augmented reality of aid beneficiaries, employees and partners in Bangladesh, Jordan, South Sudan, see how data, innovation and technology are already being streamlined to improve the WFP’s programmatic and humanitarian aid response, helping to disrupt hunger around the world. 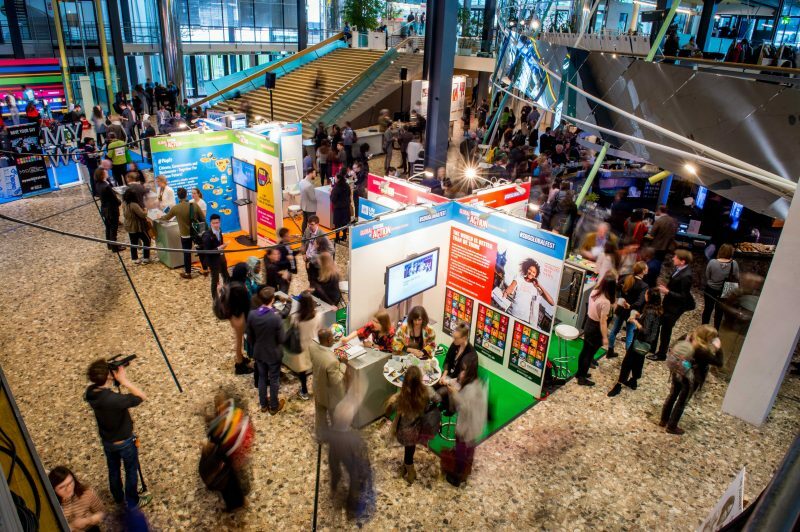 The Sustainable Development Learning Corner, powered by the United Nations System Staff College (UNSSC), is an interactive open space for knowledge sharing and learning on essential sustainable development concepts and topics. It allows for a collaborative work space with lively discussions and practical demonstrations. The SD Learning Corner will feature a wide-range of fast-paced games and group activities that will not only test each player’s knowledge and skills on sustainable development, but will challenge them to think and act differently in order to implement the 2030 Agenda. Want to join the conversation? Come to our 30-min flash workshop held on Thursday and Friday at 12:30pm in the tunnel. Whapow creates and combines premium spirulina with surplus/rescue tropical and local fruit to make 100% natural smoothies! At our booth, you will be able to experience the power and taste the deliciousness of photosynthetic microorganisms firsthand. These photosynthetic microorganisms are invisible superheroes that exist in total abundance and regenerate with unmatched resource efficiency, outperforming currently used sources of protein and other vital nutrients. Whapow’s ambition is to create a mass movement powered by chefs and the food services industry for the adoption of these microorganisms into everyday iconic foods and beverages. Our starting point: shakes/smoothies, frozen grab-n-go snacks as well as microoragnism granulates that integrate easily into daily habits. Follow Whapow on Facebook and Instagram. Learn about new ways of engaging people with SDGs with some fun and insightful SDG games! The SDGs Action card game called “X (cross)” is an easy and fun way to promote SDGs actions for people of all ages! Learn about the SDGs and actions to solve local and global problems. The game was created by the SDGs Global Youth Innovators (GYI) at the Kanazawa Institute of Technology in Japan. The game consists of “trade-off cards” which describe situations each of the 17 goals. The “resource cards” present what is available such as advanced technology such as AI and robotics, industries, traditional culture, youth culture like animation to be matched with TRADE-OFFs to solve the problem. Follow the SDGs Global Youth Innovators on Twitter, Facebook and Instagram. SDG Business Board Game: Let's Learn SDGs! Let’s Learn SDGs! The Future Technology Association for Promotion in Japan challenges businesses around the world to achieve the SDGs. They invite Festival-goers to play their SDG board game to learn about business activities related to the SDGs, collaborate with others and deepen overall understanding of the Goals. Check out the creative lineup of artistic exhibits and installations that showcase the SDGs! As a proud partner of the SDG Action Network, The Children’s Art Gallery of Greece organizes the “SDGs Creative Action Project” to connect and engage children and youth in the SDGs through the creative arts. Young Greek artists between the ages of 8 and 14 create artworks to demonstrate their concern regarding peace, the environment, education, equality. The young generation is empowered and involved in the implementation of the SDGs with the support of art! Children paint the ideal future of humanity inspired by the UN SDG Action Campaign. See this exhibit in the wooden foyer by the cloak room! The Cartoon Africa International Biennial (CAIB) festival deploys comedic arts and multimedia with graphic humor and edutainment to broaden audience engagement and catalyze actions on the SDGs and other development concerns in Africa, in a global context. At least one million African youths are targeted to be engaged/empowered and positively involved in the ongoing 14-month strategic CAIB Traveling SDG Cartoon Campaigns/art exhibitions and Workshops to foster creative dialogues, spread awareness and spur more people to taking SDG actions. Explore some of the award-winning art pieces at the Festival! Follow @CAIBNigeria. Come explore the Solar Panel Art Series on the lawn outside the restaurant on the restaurant lawn! Artwork is not just an object; it is also the experience and its contextual impact, how it is used and enjoyed, and how it raises questions and changes ways of thinking and living. The Solar Panel Art Series does exactly that, and it is a great example of how to open up the discussion about renewable energy and the unequal distribution of energy today. in addition, they not only make us think but also act. The Solar Panel Art Series decided to donate a part of their proceeds to Little Sun Foundation, in order to bring light and study time to children in rural Rwanda, and we are very grateful for this. Collectively, we can work towards global togetherness and a better future, including energy access for all. Follow @thesolarpanelartseries on Facebook and Instagram! Comics are an innovative way to reach a range of audiences around the Sustainable Development Goals. PCI Media, in partnership with UNICEF and the World’s Largest Lesson, will present examples from their Comics Uniting Nations series on the outer walls of Press Rondel (where Film Screenings take place). Download an AI application to your phone to access the full comics and more information on the initiative. Have your photo taken with live comic mascots and pick up a flash drive packed with resources! Follow @ComicsUniting on Twitter and Facebook. Faces2Hearts – Travel far, get closer! The exhibition from the Centro para la Autonomía y desarrollo de los Pueblos Indígenas (CADPI) is composed of 17 illustrations and descriptions that show the indigenous cosmovision about the SDGs, through indigenous visions, thoughts, dreams and words, which were created by over 30 indigenous people from 17 countries, who gathered together for an SDGs workshop in Santa Cruz, Bolivia, organized by FILAC. Water is life! While plastic pollution is increasingly threatening natural ecosystems, biodiversity and human health, 2.1 billion people still lack access to clean drinking water. At soulbottles, we aim to change this: our social business model helps to provide water and sanitation access globally; while our sustainable drinking bottles enable you to fight plastic day by day. Our exhibition represents the average quantities of plastic we use in our life and brings an invisible problem to the surface. Come by, have some tap water and learn important facts on plastic pollution, water and sanitation around the world! Follow @soulbottles on Instagram and Facebook. Bonnections and the “In Namen der Wellen” Initiative joined together with artists and community volunteers to create a poster series for the “One for All, All for One” exhibit, organized and curated by the NGO Posters for Tomorrow in cooperation with the UN Human Rights Office. The exhibit is part of the global #StandUp4HumanRights campaign. Come see these Human Rights posters in the wooden foyer by the cloakroom! While the SDGs are the most important to-do list in history, countries and citizens lack a personal connection to the agenda. Visualst wanted to bring these goals closer to the people and organizations who are responsible for creating the change, so we started in our own community in Mozambique. We are bringing together social practitioners, organizations, activists, artists and data scientists to blend the meaningful with the beautiful. The Art is Data project is a collective art project where SDG data is transformed into artwork because we believe that action is moved by empathy and by feeling, and art is the universal medium for emotion. Join us at the SDG Global Festival of Action to experience the art that has been co-created in Mozambique to localize and humanize the global goals!